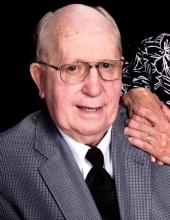 Charles Edward Leitle, age 85, of Aurora, Missouri, passed away at 6:50 a.m. on Monday, September 24, 2018, at the Aurora Nursing Center. He was born June 16, 1933, in Aurora, the son of Joseph and Barbara (Pruente) Leitle. Charles was a 1951 graduate of Aurora High School and then worked at Rocketdyne in Neosho, Missouri for five years as a data analyst. He served in the United States Army, as an administrative clerk, from 1956–l958. He received his Bachelors of Science Degree, his Master’s Degree and his PhD all from the University of Arkansas in Fayetteville. He was a statistics teacher for one year at the University of Arkansas prior to becoming a full time Economics Instructor at Missouri Southern State University in Joplin, Missouri, from 1970-1993. At MSSC he sponsored Society for Advancement of Management, Omicron Delta Epsilon and served on the Library Committee. He is presently a member of the Missouri State Retirement System and Holy Trinity Catholic Church in Aurora. On December 29, 1976, he married Carolyn Landewee in Chaffee, Missouri. In 1993 he retired from teaching and moved to the family farm in Aurora to pursue his longtime dream of farming and raising cattle. He is survived by his wife, of 41 years, Carolyn; one sister, Mary Leitle, of Aurora and several nieces, nephews, great-nieces and nephews and great-great nieces and nephews. His parents, Joseph and Barbara, four sisters, Gertrude, Josephine and Pauline Leitle and Helen Brown and four brothers, Joseph, Raymond, Eugene and Bill Leitle preceded him in death. A funeral mass under the direction of the Crafton-Cantrell Funeral Home will be held at 11:00 a.m. on Thursday, September 27, 2018, at the Holy Trinity Catholic Church in Aurora. Burial will follow at the Mt. Calvary Cemetery in Aurora. Rosary will be held from 5:00-5:30 p.m. on Wednesday, September 26, 2018, with visitation to follow until 8:00 p.m. in the funeral home chapel. In lieu of flowers, contributions may be made payable to the Catholic Charities of Southern Missouri, in care of the funeral home. To send flowers or a remembrance gift to the family of Charles Edward Leitle, please visit our Tribute Store. Mt. Calvary Cemetery, Aurora, MO Aurora 65605 MO. "Email Address" would like to share the life celebration of Charles Edward Leitle. Click on the "link" to go to share a favorite memory or leave a condolence message for the family.